And to add to the Blitzboks woes, Vilimoni Botitu crashed over from a 5 meter scrum on the stroke of half-time to give Fiji a 19-0 lead at the break. They found some of their pizazz to beat England in semi-finals and looked set for a monster win over the Blitzboks. South Africa secured just their second tournament win of the HSBC Sevens Series after beating Fiji 20-19 in the final on Sunday. However, the Springbok Sevens staged a big comeback after the interval with Selvyn Davids kicking a last-minute penalty to seal a 20-19 victory. The Americans lost the third-place play-off 28-7 to England. New Zealand's hopes of winning the overall series title for the first time since 2014 suffered a massive blow after they were beaten 19-17 by Samoa in the fifth-place playoff to drop 15 points behind the US in the race for top spot. 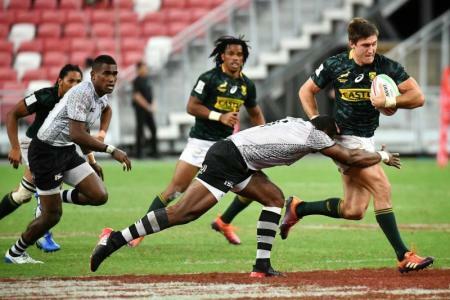 South Africa then scored two tries in two minutes as Angelo Davids scored a second, while Fiji's Aminiasi Tuimaba was given a yellow card in the build-up. Despite the heartbreak, Fiji's silver medal and 19 points took them to 142 and narrowed the United States' series lead to three points. The series will next head to London (May 25-26) before the finale in Paris (June 1-2).